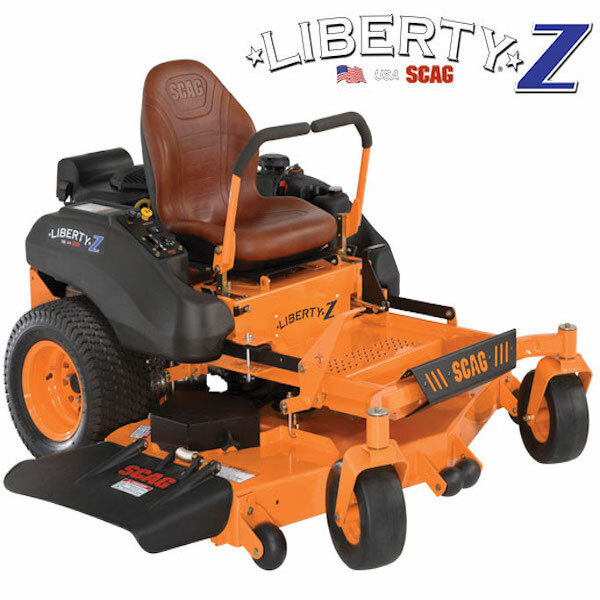 The Freedom Z ® is designed for commercial and large estate use. We invite you to learn more about the outstanding, commercial grade features of the Freedom Z and how it can save you time while delivering professional results. Give yourself the freedom to spend more time doing the things you really want to be doing like camping, fishing, spending time with your family and friends....the list goes on. This impressive zero-turn rider is designed with the needs of lawn care pros in mind. Delivering commercial-grade results at an incredible value, the Patriot will exceed your expectations and have your “competition” talking. Its strong hydro drive system brings the power and keeps you moving at ground speeds of up to 10 mph (SPZ61), while large front caster tires and extra-large drive tires provide dependable traction, stability and a smooth ride. With roaring power and agile maneuverability, the compact Scag Tiger Cat II is a force all its own. Where productivity is essential, the Tiger Cat II delivers with ease, capable of handling more than 24 acres per day. Powerful engines and a tough dual pump and wheel motor drive system ensure dependability year after year. Equipped with a Velocity Plus cutter deck, this mower will tame the tallest grass and leave it looking smooth and professionally manicured. Clocking in at speeds up to 10.5 mph and featuring a coil-over shock suspension system, the Cheetah is truly a remarkable zero-turn mower. The Operator Suspension System isolates the operator platform via a coil-over shock and provides additional comfort via rubber iso-mounts. This innovative, adjustable system soaks up the bumps and keeps things simple with only three moving parts. The ZT-3400 transaxles are built to last and deliver smooth and positive drive performance. The large 10 gallon fuel capacity (dual tanks) keeps you in the field cutting grass. Fill up in the morning and cut all day long. 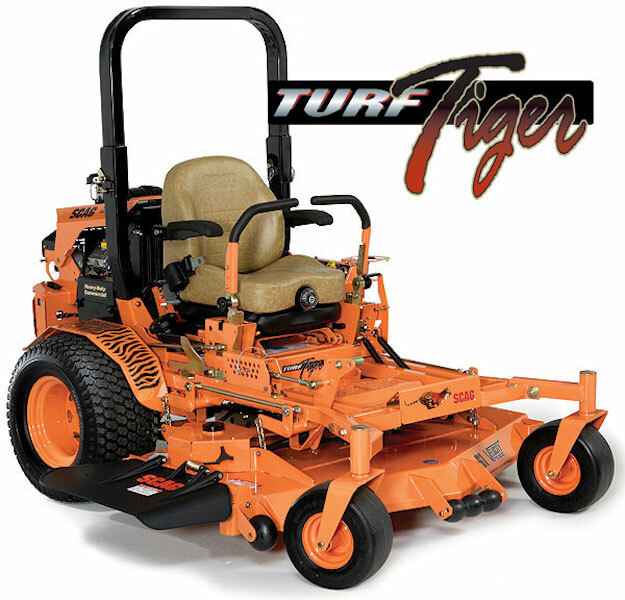 The all-new Turf Tiger II stands heads and tails above the crowd in power, durability and performance. This industry benchmark has been re-engineered to be as easy on the operator as it is efficient on tough jobs in the field. No matter how challenging the terrain and cutting conditions, the Turf Tiger II makes mowing a snap. From the heavy-duty, Tri-Plate Velocity Plus cutter decks to its extra strength double-tube steel frame to the dual 16cc hydraulic pumps and high-torque wheel motors, this cat is ready for action. The Turf Tiger II features the exclusive Command-Comfort Operator Station with adjustable 4-point iso-mounted suspension seat and Quick-Fit adjustable steering control levers to make your time spent in the driver’s seat more comfortable and more productive. With speeds up to 12 mph, huge-horsepower, fuel efficient engine options like the fuel injected Kawasaki or Kohler EFI, massive 37hp Big Block EFI models, or Kubota Diesel models, there's a Tiger II that will increase your productivity and send your competition running for cover! A larger capacity fuel tank and a heavy-duty hydraulic oil cooler, the Turf Tiger II is geared up to take the “hard” out of hard work. All SCAG zero-turn mower engines come with a 3-year manufacturers warranty. By purchasing a 4-pack of Opti Engine Oil customers can double the life of their engine warranty. Interlube, the manufacturer of Opti Engine oil, is so confident in Opti-4's ability to increase performance and extend engine life through its Eutectic anti-wear additive that when a qualifying pack of Opti-4 is purchased with a new piece of 4-cycle power equipment, Interlube will double the engine warranty on internal engine parts up to 31hp. Click HERE to learn more.